Surprisingly, these October days have been fairly mild. The first weekend of October we had 2 nights of cold air, but stayed frost-free in Missouri. Dean and I were in Milwaukee, Wisconsin that weekend, where frost covered the corn fields and pumpkins. Snow came down in the northern part of the state. In Missouri rain and more rain last week and through the weekend, but still no frost in our neck of the woods. My herb bed still produces lush greenery. I have delayed potting the herb plants for the kitchen window. They do so much better in natural light, warm air, and a bed of organic soil. Tonight I needed to get away from the madness of the local urban troubles to my green sanctuary. Dean and I headed to our greenhouse situated in the countryside ar Boone Hollow Farm. Mild evening, still in the 60’s and the rain had passed for the time being. The creek had a steady flow over the rocks in the road next to the barn, which evenually leads to the greenhouse. Bugs sang their soothing tunes while we watered our geranium starters, hanging moss baskets, and the herb bed inside the screenhouse side of our structure. Despite the early sunset, I needed more green therapy. So I repotted some basil, sage, summer savory, wild parsley, and marjoram under the light of our gas lantern. Mid-June two misly sprigs of marjoram sprouted from a old packet of seeds. But look what produced, this huge herb plant. 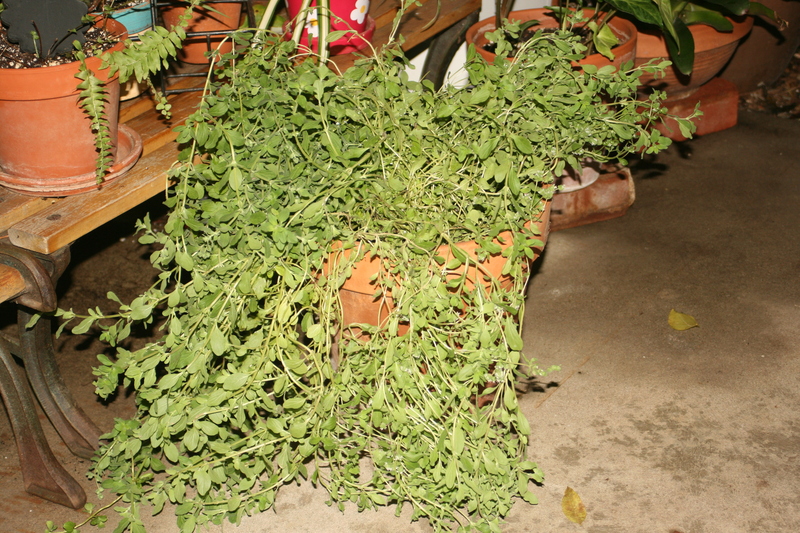 This October evening I pulled the marjoram jungle from its organic bed and potted it into a 14″ terra cotta pot. My pot overflows! Good organic soil, regular watering from the well or our rain barrel late summer into early autumn, and mother nature takes over. Oh how green friends can bring joy in life once again! Oh the pain of it all, I say at times. Life has bitter lemons. But lemons make lemonade, don’t they? Just add some sugar, the sweet stuff that makes life worth living. So what sweet stuff will you add to your day today? I will tell you that grandkids, especially granddaughters are sweet and spicy. And grandsons keep the ball rolling with adventures. So my sweet stuff today are my grandchildren, Hannah, Libby, Ella, Brendan, and Eli! Blessings always!